As the title suggests, this article is aimed at complete novice sheep keepers or indeed anyone who is considering it. I am neither encouraging nor discouraging but will do my best to explain what it entails in the hope that it will be of benefit to both sheep and owner should you decide to go ahead. There are plenty of books and magazine articles which regurgitate information about breeding, feeding, lambing and sheep ailments in a clear, accurate and factual way, maybe far better than I could, but here I have tried a different approach and explain the basics that I have gained from first hand experience – warts and all. It makes me cringe when I hear people say in a flippant way that they want to keep a few sheep to save having to mow the paddock. There is a lot you need to know to avoid mistakes that can lead to an unpleasant experience for both sheep and owner. Every sheep farmer will have a few disasters in their career and no doubt you will too, but set out below are three little rules I hope will at least minimise their occurrence. I am strongly tempted here to add a fourth rule which is ‘Don’t give up the day job’. Despite what you may have read in magazines or seen on TV, no one is going to move out of the city, buy a piece of land a fraction of the size of a commercial farm and live off it. If anyone appears to be making a cosy living keeping a handful of sheep spinning the wool, dyeing it in blackberry juice and then knitting it into garments to sell at the local market there is something they are hiding. OK, I know I sound cynical, but I’m sixty seven years old and this is only what experience has taught me. I have lived in the country and worked outside in one capacity or another all my life, have been happy doing it and believe many other people would be too. All I am saying is keep a grip on reality. This is definitely the most important of my three rules, even if you choose to ignore the other two, please, please, follow this one! I read somewhere, I think it was in one of John Seymour’s books, that anyone contemplating keeping sheep for the first time should get themselves a sheep Guru, an experienced shepherd who can mentor them through their early years with sheep. This is a great piece of advice; and if you can find someone like this, who really has a lot of experience and is prepared to mentor you, then you have struck gold. However, you are much more likely to finish up with the opposite, i.e. someone who knows bugger all about sheep but claims to know the lot, plus a load of clever dodges and miraculous home remedies that no one else has even heard of and who just likes an appreciative audience. As the old Taoist philosophers of ancient China used to say, ‘Those who speak do not know. Those who know do not speak’. 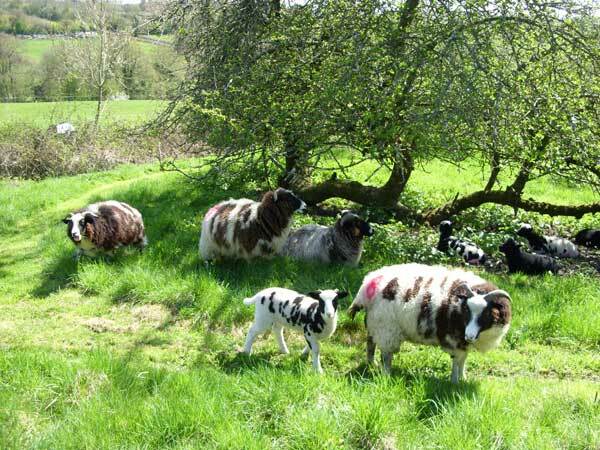 What I would strongly recommend is that, before buying any sheep of your own, you spend whatever time you can working with or for someone who keeps sheep in a proper way and preferably on quite a large scale and very definitely get some experience of lambing. Because if you don’t and your pet sheep that you reared on the bottle, gets complications delivering her first lamb at 2am you will wish with all your heart that you had. A book or DVD, however good, just isn’t enough!! Whether or not you manage to get a sheep guru on hand you will definitely need to establish a contact with a vet who is prepared to come out to you when needed and also a knacker who will take away any animals that die on the farm as it is illegal to bury them! This will save you time, money and heartache. Don’t be tempted to acquire old, unhealthy or ‘rescue sheep’ until you have had masses of experience and really know what you are doing. I know of people who have started a flock by buying orphan lambs and bottle rearing them in the belief that their adult sheep will then be nice and tame, and so they probably will, so tame in fact that when they are fully grown they will come charging down the field towards you expecting to be fed and knock you or your visitor flat on your back. Likewise avoid bidding for stuff in a market. This really is the preserve of the expert and is at best a hit and miss affair. Keep whatever breed takes your fancy, but try to get them from the breeder of a pedigree flock where you can see where they come from, how they are kept, and what you are buying. There is an old farming saying that goes ‘Good stock will make a man. Bad stock will ruin a man’. If you can bear to do so, just ignore the anachronistic sexism inherent in this little homily and just go with the underlying principle and you will find that it holds as good today as it ever did. You will almost certainly get what you pay for and the best will be the cheapest in the long run. If sheep can get out they will; and they are most likely to do it at the most inconvenient time. Lambs will get out because they are curious and playful, newly arrived sheep will get out because they want to go back to where they came from, and rams in the mating season will go to extreme lengths to get out in order to find partners. So before your sheep arrive try to get someone who knows a bit about it to check your fences and do any work that needs doing. Unless you are an experienced fencer or competent DIYer I urge you to dig into your bank account and hire a professional. It is hard physical work, and there are several pieces of fairly expensive kit that you will need in order to do a good job. If you are hell bent on doing it yourself then at least buy a copy of Andy Radfords ‘Guide To Stock Fencing’ – study it thoroughly and follow it closely. Okay, as I said, this article is aimed at complete novices so I am going to start with some sheep farming vocabulary. EWE – Adult female sheep, pronounced so as to rhyme with new. Sometimes pronounced ‘yo’ in the South West to rhyme with ‘go’ and in parts of Northern England pronounced ‘yow’ to rhyme with cow. HOGG – sheep over a year old but less than two years, I think though this definition can vary from one region to another. CULL(a verb) – to dispense with live animals that are no longer worth keeping. A sheep’s nutritional requirements will vary throughout the year, and will be at their highest during late pregnancy and lactation. For most of the year they will get all they need to eat from a field of grass. 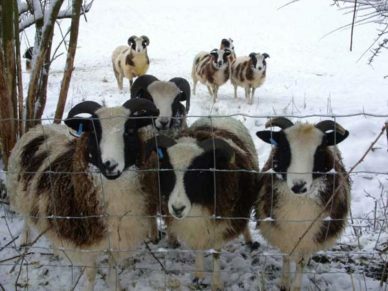 They will need some hay to supplement diet from roughly Xmas to Easter (obviously a bit of common sense needed here, though) and ewes in late pregnancy and those that have recently lambed will need a bit of additional food in the form of ewe nuts. Most flock owners start this supplementary feeding about six weeks before the ewe is due to lamb. You can put this food in a trough but if your animals are outside you can just spread it out on a clean bit of grass. Don’t worry about wastage, the sheep love this food and will sniff around until they find every last piece. Start off with a very small amount each day and build up the ration gradually ; two pound per day per animal is reckoned to be about the maximum safe amount. If there is no decent grass around by the time the ewe lambs you will have to carry on feeding her. Producing milk for her lambs is even more of a demand on her system than the pregnancy. There is something like forty different breeds of British sheep. Dorset sheep are the only British sheep that will give birth at any time of year. All other breeds will only do so in the spring, although in practice the definition of spring can be stretched pretty much from New Years Day to the Summer solstice. Unless you have a clear reason for doing otherwise though, it is best to aim to have your lambs born in April or early May. The worst of the winter weather will be gone and the grass that is just beginning to grow will be full of protein and will enable the ewes that eat it to produce plenty of milk. The ram does not normally run with the ewes all the time and is just put in the field with them during the time you want him to get them pregnant. One ram will normally be all you need to impregnate up to forty ewes. The pregnancy period of a ewe is a hundred and forty seven days.So, if you want lambs born in April you will have to get your ewes mated in November. It is exactly a hundred and forty seven days from Bonfire night to April Fool’s Day and you can use this convenient fact to calculate the date on which a ewe is due to give birth. It is customary to cover the rams chest in a coloured dye known as raddle. The modern way is to put the ram in a leather harness with a wax crayon on it, the old fashioned way is to just mix up some raddle powder with cooking oil and apply it with a brush so that when the ram jumps onto the ewes back to mate he then leaves a coloured mark there. If you know when your ewe mates with the ram you can work out when she will lamb. 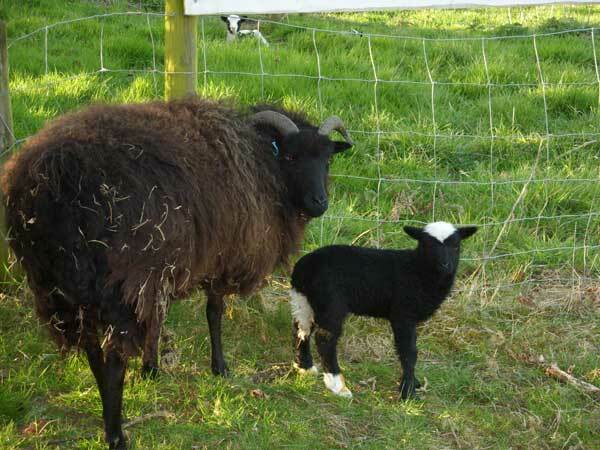 A ewe lamb born in the spring will be about six or seven months old when mating comes around and will be too young to breed from and will have to be kept out of the breeding group for another year. However, a ram lamb born in the spring will be ready for action at six months if not before and this is one of the reasons for castrating any male sheep you don’t want to breed from. This is normally done by placing a rubber ring over the scrotum and, by law, must not be done after the animal is a week old. I cannot possibly say all that needs to be said about lambing in the space of this article and what follows is just the briefest of summaries. Lambing, for most people is the most thrilling and satisfying part of sheep keeping. It is also the most important and demanding part and if it goes wrong, the most distressing!! Read all the books you can find on the subject and by all means go on a course at your local agricultural college, but there is no substitute for the real thing and nothing will teach you as much as working with a professional shepherd at lambing time in a large flock. Make sure you know how to deal with prolapses, breach births, and large lambs that have to be pulled out. You can also get clued up on treating lambs with hyperthermia and fostering orphan lambs, although I have kept sheep for fifteen years and have never had the need or the opportunity to do either. 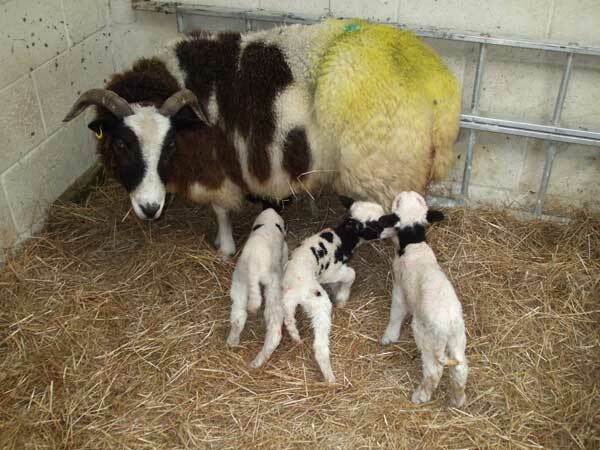 However, I have had a ewe that gave birth to quads and we had to supplement the ewes milk with bottle fed formula. I have also had to restrain a ewe still while her lamb suckled from her because she had totally rejected it. Most people have the impression that ewes nearly always give birth at night and, in fact, a lot do, but in my experience they can give birth at any time of the day or night and in my little flock, if there is a peak period, it is probably early afternoon. If you have used the raddle as previously described you will know when your ewe is due to lamb and they are very rarely more than about one day late. When she is starting her labour the ewe will usually wander off on her own to a quiet spot and if all goes well expel her lamb or lambs with very little fuss. After a few minutes the lambs usually struggle to their feet, stumble around for a few minutes more and then after a few failed attempts find the ewes teat and begin to suckle. You can take a chance and just let the ewes give birth out in the field, but if something goes wrong it is much better to have them in a confined space in a building of some kind and preferably with some decent lights. Most sheep farmers will divide up their shed space into a number of cubicles known as lambing pens with each one just big enough for one ewe and her lambs. You can try getting the ewe into one of these pens before she lambs but I found that with my sheep this seemed to distress them and leave them very agitated, so during the day I let them graze in a small paddock and at night I confine them to an open yard next to the lambing pens and let them drop their first lamb outside. I then pick up the lamb and carry it into the pen. As long as the ewe can see the lamb the whole time she will follow you in no problem. If she loses sight of the lamb, she will probably get confused, panic and go back to the spot where she gave birth to look for it. Most of my ewes have twins and there is usually about a half hour interval between their arrival, so that should give you time to get her into the pen before the second one arrives. Once she has her lambs the ewe will be quite happy to stay there in the pen for at least twenty four hours while the lambs build up their strength. One little fact that none of the books seem to mention is that giving birth seems to make a sheep madly thirsty and once the lambs have been safely delivered you should give the ewe a bucket of clean water. She will nearly always drink most of it in about thirty seconds. The newborn lamb will have the remains of the umbilical cord hanging from its navel and you should bathe this in an iodine solution as soon as possible to prevent infection. As I said, there just isn’t the space here to tell all that you need to know and lambing, probably more than any other aspect of sheep husbandry, is the bit you need to get right, so please get some training! Domestic sheep have been bred for several thousand years to produce an abundance of wool that has to be sheared off them every summer. The only British sheep that this does not apply to are Soays and Wiltshire horns who don’t grow much fleece and just shed it naturally. The fleeces used to be a significant amount of the flock’s annual sales figure but these days they are worth very little. You still have to have your sheep shorn though. You can shear sheep with hand clippers costing about twenty quid, but most folk will find it too hard going and call in a professional shearer with all the modern gear. 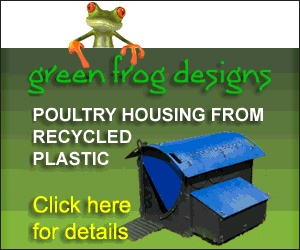 For a small flock this is usually unpleasantly expensive but you have to do it. Shearing might seem romantic and I and many others find it fascinating to watch, but it is bloody hard work and the guys who do it will earn their money. Most professional shearers, incidentally, make Ross Poldark look like a wimp. Some commercial sheep farmers house their animals for the winter and will have them shorn so they don’t take up so much room in the pen, but normally shearing will take place in the early summer. The exact date will depend on the breed, the area of the country, the weather and the shearers work load. Lambs are not shorn, so a sheep born in spring will be just over a year old when it is first sheared. Regardless of gender it is then known as a shearling. When, in the following year, it is shorn again it becomes known as a two shear and so on. Like lambing, this is a vast topic that I cannot hope to cover fully and is like gardening, probably something you continue learning about all your life. I think it is fair to say, though, that the vast majority of sheep ailments centre around newborn lambs and pregnant or lactating ewes; so, if for any reason you decide to keep sheep but not breed from them, you will be far less likely to encounter a problem. There are any number of illnesses that could suddenly appear in your sheep and so for this reason you should look at all your animals at least once a day. Believe it or not, someone asked me once if a sheep would come and tell you if it felt ill. Trust me, they don’t! they are far more likely to sneak off away from the rest of the flock and hide in the hedge. So for this reason, count your flock every day to make sure they are all there and quickly run your eye over each animal and if it is looking in anyway unusual then catch it and investigate. This is when you will need a handling pen of some sort. You can make a portable one out of metal hurdles or you can build a sort of Wild West style coral out of scrap timber but, contrary to what TV programme makers would have you believe, you will never catch a sheep by chasing it round a large field, even if trying to do so does make good viewing. Firstly you could enlist the help of friends and neighbours and form a cordon to drive them in – this can work but there is a real hazard of the sheep trying to break out and knocking over one of the helpers as they do so, probably the smallest one. Secondly you could buy a trained sheep dog; this would work but it will cost you to get a good one and unless you are an experienced dog handler your dog will gradually pick up bad habits and finish up nothing like as good as it was when you bought it and being a bit of a disappointment. The best option I can think of for most newcomers and small timers is to get your sheep trained to come into the pen to be fed. This is not the same as bottle rearing an orphan. All you do is buy a bag of sheep nuts and every day when you check your flock put a very small quantity of said nuts into a metal bowl, go out into the field and rattle it and then sprinkle the nuts on the floor, after a few days of this the sheep will all come running when they hear the ‘Nut Bowl’, and at this point you can start sprinkling the nuts nearer and nearer to the entrance to the pen and then each day get them a bit further inside it. As they say learning is reinforced by repetition. My sheep can hear me opening a plastic feed sack from a hundred yards away and will all come running up to the gate! As I have already said, I cannot discuss all the ailments a sheep could possibly get. That would be enough material for a large book. All I have space to say here is that there are three routine preventative medicinal treatments that every responsible sheep owner should carry out. The first is to inject all your pregnant ewes with Heptavac, which will protect the young lambs from a number of disease. The second is to treat your sheep for stomach worms and there are nearly as many schools of thought on this subject as there are flock owners. I dose all my sheep orally with a product called cydectin. The ewes get it soon after lambing, the lambs when they are six weeks old and then they all get another dose in the Autumn. Our local vet seems to favour doing a worm egg count taken from sheep’s stool samples and then prescribing treatment accordingly. The third thing you must do is treat your sheep with a fly strike preventative. Any time from Spring through to late Autumn green bottle flies may decide to lay their eggs on a sheep. For some reason, lots of flies tend to hit on one particular animal. When the eggs hatch out into maggots they will eat the sheep alive. And yes, the reality of this is every bit as horrible as it sounds ! The only good news is that it is almost completely preventable by spraying your animals with products known either as Click or Crovect. One spraying will give cover for about five weeks and newly shorn animals won’t need spraying for at least a month ; so two or three spraying a year is all you need. If a sheep does get ‘struck’ as they say, you must move quickly. The first signs are likely to be repeated swishing of the tail or maybe frantic biting or rubbing, later it will look dejected and miserable and it may try to hide away somewhere. 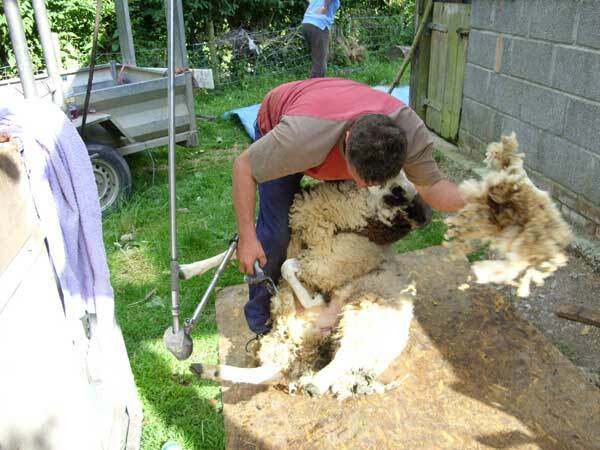 There is likely to be at least one dark stained patch of fleece where the maggots are and if you can get close enough you will notice a distinctive foul smell get it into the handling pen, use dagging shears or kitchen scissors and cut off the fleece in the affected area as close to the skin as you can. Scrape off all the maggots with the back of the shears or whatever and examine the sheep all over really thoroughly and pick off every maggot you find. Finally, give the animal a spray with Crovect and check it again after a few hours. It’s not a pleasant job or one that you can do in five minutes, but it’s the reality of keeping sheep so if you are not prepared for both good and bad aspects a shepherd’s life may not be for you. Many thanks for this article Jonathan. I am just about to start my sheep-rearing career and found this really helpful, informative and honest! Thank you, Jonathan, for this article. I’m at the research stage so will source a place for Golden Rule 1 this coming spring. Appreciate the time and knowledge you have imparted. 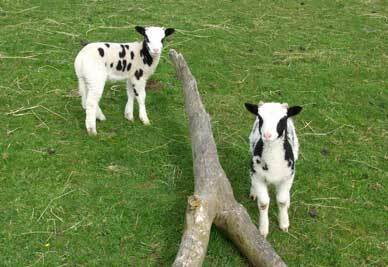 Fascinating look at the basics of sheep raising. I am doing research for a book [fiction] and being a city dweller, I need some nuts and bolts knowledge of the reality of sheep raising. Thank you for this. Thank you very much for a wonderfully informative article. Great informative read about the pleasures and pitfalls of sheep keeping; love your writing style. I must find me a kindly shepherd to hang out with.